Image caption Mr Erdogan described the latest PKK attacks as "cowardly"
Turkey has vowed to fight Kurdish rebels until they are "annihilated", after attacks killed 11 soldiers. PM Recep Tayyip Erdogan said Saturday's "cowardly" assaults would not end Turkey's determination to fight the Kurdish Workers' Party (PKK) "to the end". The army said it had retaliated with a helicopter attack that killed at least 12 rebels. There has been a sharp increase in the number of recent clashes with the PKK. On Friday the Turkish military said it had killed about 120 Kurdish rebels since March, while 43 members of the Turkish security forces had also died. Rebels killed nine soldiers in a raid on an outpost near the Iraqi border early on Saturday, in the deadliest attack against the Turkish military since April 2009, when nine soldiers were killed by a roadside bomb that was blamed on the PKK. The deaths of 11 men in a single day will certainly harden official attitudes towards the PKK. In a country where every soldier's funeral whips up a frenzy of nationalist sentiment, Mr Erdogan's party is vulnerable to charges of selling out to terrorists, because of its efforts last year to promote a softer approach to the conflict. The increasingly bold attacks by the PKK this year have effectively killed off that initiative, although it was already running out of steam. But after 26 years and 40,000 deaths, few officials can be under any illusion that just throwing more military forces at the PKK along the Iraqi border can finish the movement off. Later on Saturday, two soldiers were killed in a mine explosion while attempting to capture rebels near the border. As well as responding with helicopter attacks, Turkey launched air raids on PKK positions inside Iraqi territory. 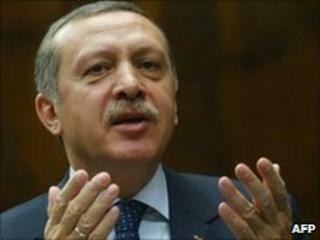 Mr Erdogan said his government would not "give in to the spiral of violence" unleashed by the rebels. "Our fight will continue until the terrorist organisation has been annihilated," he said. He plans to travel to south-east Turkey later on Sunday to attend a ceremony for the dead soldiers, the state-run Anatolian news agency reported. The PKK, meanwhile, said Turkey wanted to "take us towards war" rather than dealing with the "Kurdish issue" peacefully. "We will take our operations to all Turkish cities if the government continues its attacks against us," PKK spokesman Ahmed Denis told AFP news agency. Turkey has urged Iraq's Kurdistan Regional Government (KRG) to expel the 2,000 PKK fighters believed to be based in its territory, saying it must promote efforts to curb the banned group's activities. On Wednesday, Turkish troops crossed into northern Iraq and killed four PKK fighters after the group made an unsuccessful attack on a border outpost. Last month, imprisoned PKK leader Abdullah Ocalan said he had given up any hope of dialogue with the government. But correspondents say the clashes had resumed well before that, and the real reasons for this sudden resurgence of fighting are not clear. The PKK began its armed struggle against the Turkish government in 1984, calling for a Kurdish homeland within Turkey. More than 40,000 people have been killed in the resulting conflict. Last year, the Turkish government announced a new initiative to end the conflict and to address the grievances of the Kurdish minority, but it never produced the promised package of measures, and now appears to have abandoned the initiative, correspondents say. The PKK is officially branded a terrorist organisation by the US and European Union.